What would you do if you woke up every morning with no memory of who you are? Where you are? And who the man walking into the bedroom towards you is? 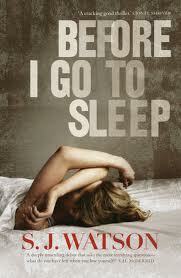 Before I go to Sleep is a psychological thriller about a woman suffering from anterograde amnesia (the loss of ability to create new memories after the event that caused the amnesia, leading to an inability to recall the recent past but with long-term memories from before the event usually remaining intact). The novel follows her day by day as she tries to reconstruct her memories from a journal she finds that apparently she has written. She learns that she been seeing a doctor who is helping her recover her memory, her name is Christine Lucas, she is 47 years old and married, and she has a son. But is this the truth? As Christine ‘rediscovers’ her journal each day, and reads more and more about her own life, she feels increasing disquiet at the ‘official’ story and with the man in her life who claims to be her husband. This makes for an uneasy read, it is a great first novel that cranks up the tension very effectively as more and more is revealed. I loved this book – very disturbing, but effectively executed. I really enjoyed it, it was quite menacing in parts!